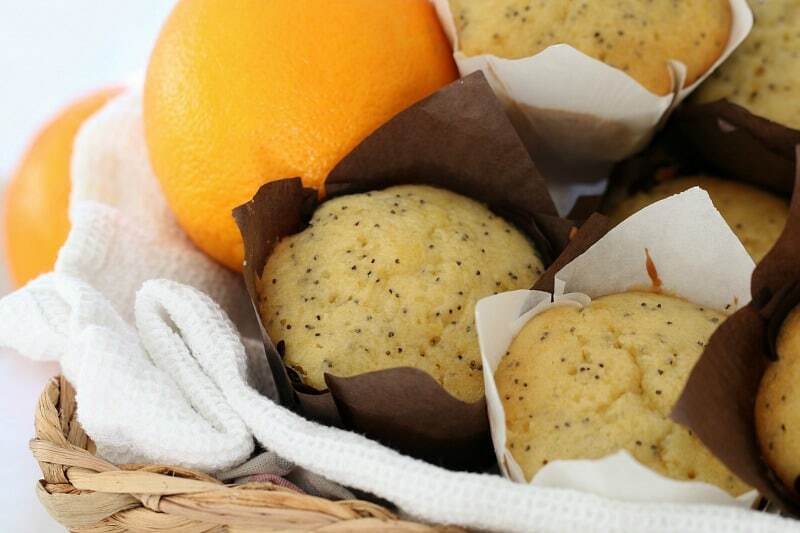 These perfect Orange & Poppy Seed Muffins with Syrup are sure to become a family favourite in your house… they certainly are in ours! So quick, easy… and delicious! For those of you who know me in real life (or have been reading this blog for a while… in which case you totally know everything important about me!! ), you’ll know that my hubby, Dave, and I met a long time ago. Like nearly 14 years ago. Eeeek!!! Anyway, I like to think that I know pretty much everything about Dave. But boy oh boy, was I wrong. 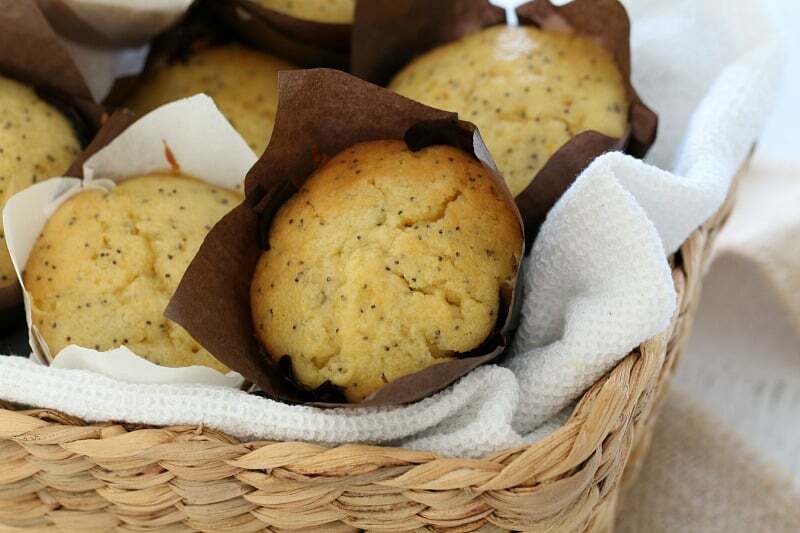 Yep, there was one big thing that I didn’t know… he loves Orange & Poppy Seed Muffins. Umm – how did it take me 14 years to know that? I know everything about Dave… and sugar!? Don’t I?? This all came about when we were out for the day and Dave ran in to a cafe to grab us some coffees and a muffin. I’m pretty sure I was changing Will’s nappy at the time – so clearly the coffee run was the pick of the jobs to do. Darn nappy changing! And he came back with an Orange & Poppy Seed Muffin and started telling me how much he loved them. Whhhhhhaaaaattttt!!!?? Did he not realise that if I knew this super important bit of information, I would have had the best excuse to be baking them for all these years? Did he not realise that he was holding back my love of a sugar-filled muffin? Geeez. 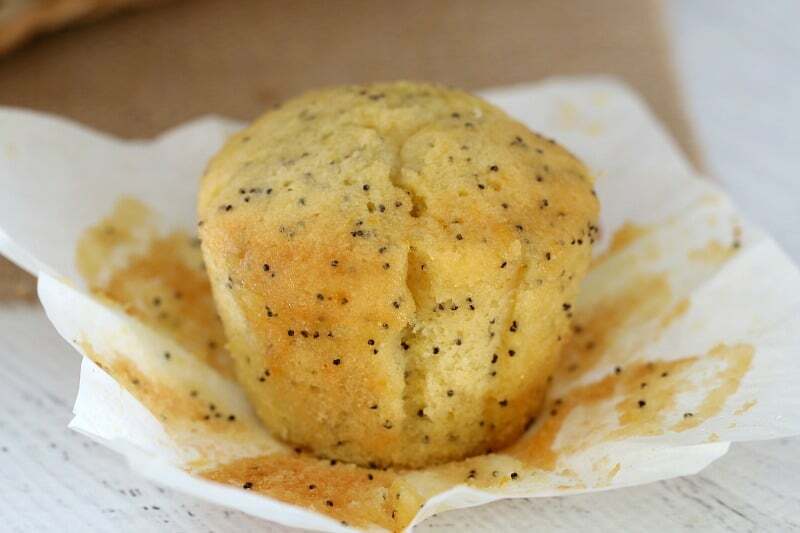 And so, the following week I made a batch of orange & poppy seed muffins with syrup (because syrup is a girls best friend). I told him that I made them because I’m a really nice wife. But lets face it… I just really like muffins. 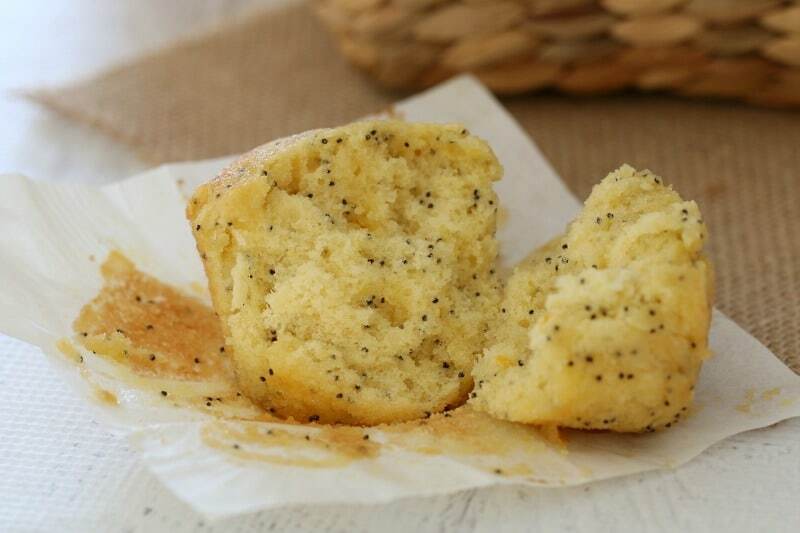 Anyway, I now have the perfect excuse to make orange & poppy seed muffins with syrup. Like ALL THE TIME. Just because I’m a really nice wife, riiiiight!? Love a fruity muffin? Make sure you also check out my healthy banana and chocolate chunk muffins, my fave white chocolate and raspberry muffins and these good old classic blueberry muffins! 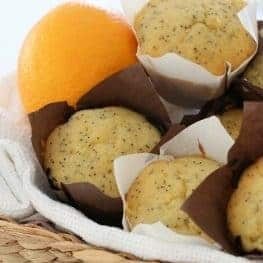 These perfect Orange & Poppy Seed Muffins with Syrup are sure to become a family favourite in your house... they certainly are in ours! So quick, easy... and delicious! Cream the butter and sugar until pale. Add the eggs one at a time, beating in between additions. Add the vanilla extract and milk and beat until combined. Add the orange juice and beat until combined. Fold through the self raising flour, poppy seeds and orange zest until just combined (be careful not to over mix- the mixture can still be a little lumpy). Spoon into the prepared muffin cases. Bake for 20-25 minutes or until they spring back when touched lightly in the centre. Allow to cool for 5 minutes before transferring to a wire rack. While the muffins are still warm, poke holes with a skewer onto the top of each (about 5 holes in each). Place the orange juice and caster sugar into the microwave. Cook on 30 second bursts for 3 minutes. Spoon the syrup over the top of the muffins (make sure you have a tray to catch the drips underneath the wire cooling rack). Store in an airtight container for 3-4 days or freeze for up to 3 months (wrapped individually in cling wrap and then placed into an airtight container). Place the self raising flour into the TM bowl. Press Turbo 5-10 times to sift. Remove from the bowl and set aside until needed. Place the butter and sugar into the TM bowl. Mix on Speed 4, 30 seconds. Scrape down the bowl and repeat for a further 2 times until pale and creamy. Reduce to Speed 2 and add the eggs one at a time while the blades are turning. Increase to Speed 5, 20 seconds. Add the vanilla extract, milk and orange juice and mix on Speed 4, 20 seconds. Add the self raising flour, poppy seeds and orange zest and mix Speed 5 15 seconds (using the spatula to help mix). 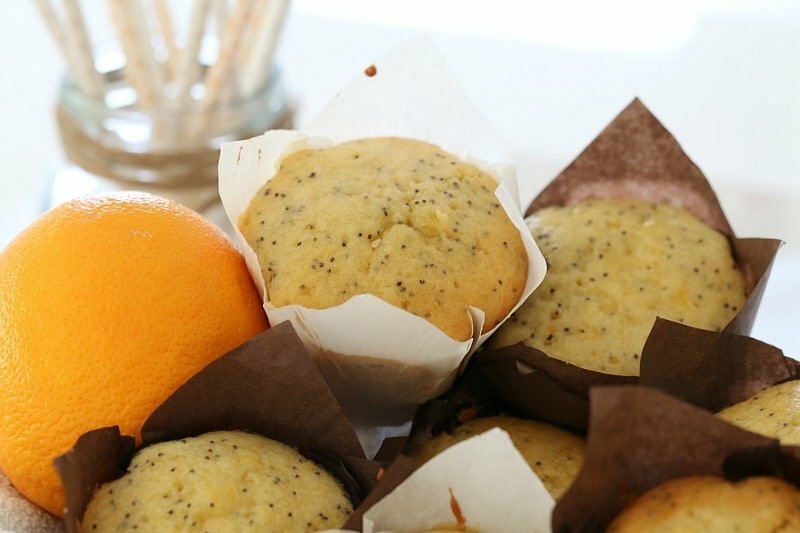 I love Orange and poppyseed muffins! 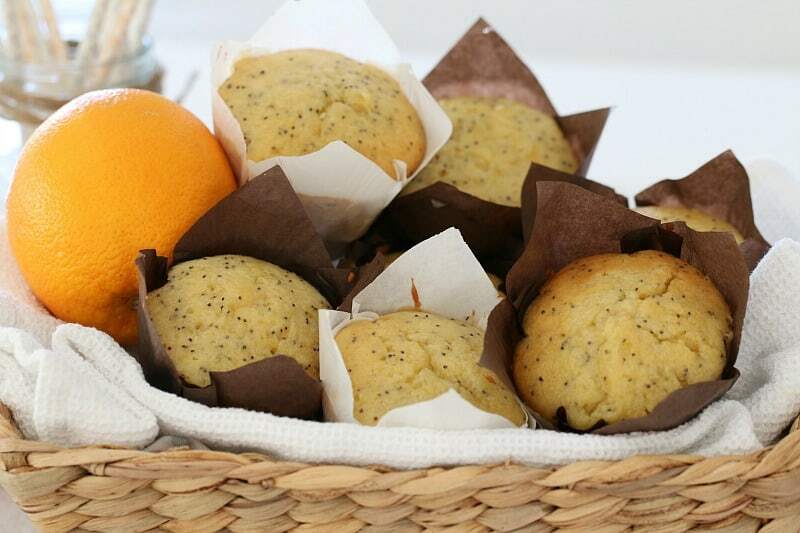 I used to work at a cafe which had about 15 types of muffins and orange and poppyseed were by far the best. Love that yours have a syrup – delish! Thanks so much Jayne – they really are a cafe favourite!! I made these in my thermomix and baked them for 20 minutes but they came out really dry and crumbly. Has this happened to you before? Hi Chantel, oh no!! No that has definitely never happened – these are very moist! I wonder if you’re oven is running too hot? Another suggestion is to make sure the muffins are the furtherest away from the heat source (ie. in a fan-forced oven, you’d want to put your tray on the bottom rack). Does that help? Just had my TM mini Orange and Poppy seed muffin for morning tea. Delish! Thank you. I didn’t bother doing the syrup as I felt we had enough sugar but I’m sure it would make it extra delicious! Also do note that the orange juice quantity is different from the cake mix to the syrup. At first glance I just saw the syrup quantity and added it! oops, I was then left pouring liquid out. Hi Lucy! 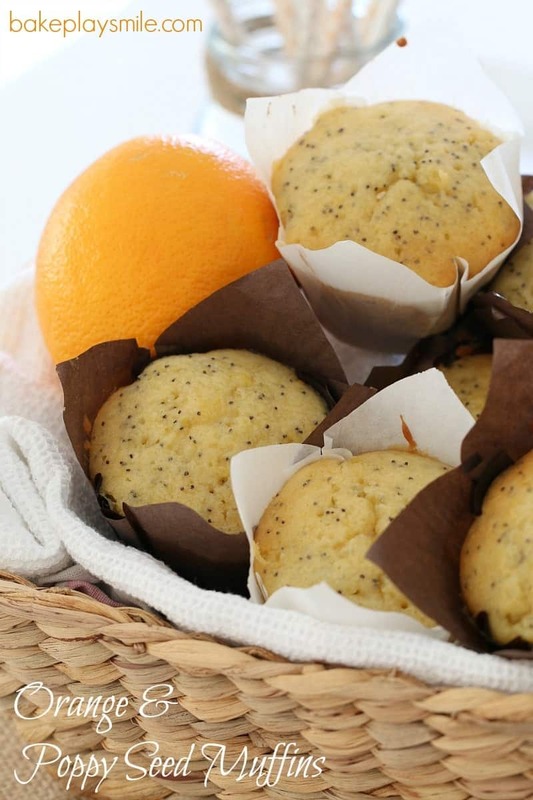 Can I make this muffins replacing the oranges by lemons? Thanks!! Greetings from Chile, I love your blog!